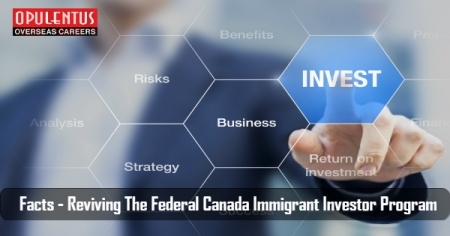 The Federal Canada Immigrant Investor Program was terminated in 2014, but it remains controversial with supporters and critics. Furthermore its Supporters say that the non existence of a viable federal investment program makes Canada in failing to capitalize on a rich sector of the immigration landscape. Additionally there are Critics who say that the the C.I.I.P. symbolized bad policy and poor implementation practices. The result was devaluation of Canadian citizenship which impacted adversely on the real estate markets in Toronto and Vancouver . The federal government also must look at the progress of Quebec Immigrant Investor Program, for its management initiatives in a passive immigrant investor program . Applicants having a net worth of minimum $1.6 million gave a refundable deposit of $800,000, to the government, for five years which did not carry any interest . The government also retained the interest earned on the deposit during the period. Finally the provinces received a share of the interest. This program was closed owing to lack of integration of investment immigrants. Moreover there was a limited economic benefit in it. Countries which have a passive investment immigration program often suffer from an inflated real estate market. In Canada, many successful applicants settle in British Columbia, in Vancouver. Economists also feel that the real estate market in Vancouver has not recovered fully from the damage of the C.I.I.P.. Critics say that the Q.I.I.P. is a back door entry for wealthy immigrants to migrate to other provinces. In 2016, Montreal had the sixth rank in the list of cities having most applicants under the Q.I.I.P.. The applicants move to Toronto /Vancouver soon. There is sufficient data to show several benefits of the C.I.I.P. An analysis of 2015 in the Q.I.I.P. shows that the province gained $40,000 for every settled investor, after factoring all metrics. The program resulted in the creating of 43,000 jobs from 2001 to 2015. Research suggests that the existence of a federal program may have helped in creating 11,000 full-time jobs from 2007 to 2011. Additionally when a program is managed well, it brings wealthy immigrants who boost consumption demand. Furthermore, there are significant human capital benefits of children of a wealthy immigrant. A study in 2010 had indicated that each family spends on an average $750,000 in investments, goods, homes, and other services. Finally after noticing the success of the Q.I.I.P. a new and ideal C.I.I.P. deserves a consideration. All the problems of the previous federal program, can be addressed. The government also needs to consider significant changes and improvements seeing other successful international residence-through-investment programs. This will also ensure that the C.I.I.P. offers benefits for Canada.